Drop your ear towards your right shoulder. Repeat to the left. Look over your right shoulder. Repeat to the left. Roll your shoulders backwards. You must actually feel that your shoulder blades are moving. Repeat 15-20 times. Lock your fingers together and hold your hands before your chest. Move your arms forward until you feel the muscles stretch between your shoulder blades. Hold for 15 seconds. Sit up straight. Inhale as deep as possible until you can feel the lungs expand to their maximum capacity. Hold your breath for 5 seconds, and exhale as much as possible. Repeat 10 times. Maintain every stretch for 10 seconds. Progress the stretches to 30 seconds within the first 10 days. Repeat every stretch twice. When you do your stretches, you only go into the range until you can feel a slight pull. That is the position that you must hold. If the stretch becomes painful or uncomfortable, release the intensity of the stretch on the muscle until you only feel a slight pull again. If you do not feel a stretch after a while, go further through the range until you feel a slight pull again. Put your left hand behind your back. Tug in your chin and bend your head forward. Tilt your ear towards your right shoulder. Now use your right hand to pull your head forward at a 45º angle towards your right. Repeat the stretch on the opposite side, swopping arms. Put your right hand behind your back. Tug in your chin and bend your head forward. Tilt your ear towards your left shoulder and turn your chin to the left. Now use your left hand to pull your head forward at a 45º angle towards your right. Repeat the stretch on the opposite side. Put your left hand behind your back. Tuck in your chin and bend your head forward. Tilt your ear towards your right shoulder, but turn your chin to the left. 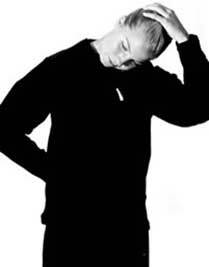 Now use your right hand to pull your head forward at a 45º angle towards your right. Repeat the stretch on the opposite side. Keep your head up and look straight ahead. Make sure that your head is not tilted, twisted or turned (preferably before a mirror). The joints are not allowed to move, but only a contraction of the muscles must be felt. Put both your hands against your forehead. Apply pressure with your head into your hands, but no movement must take place. Hold the contraction for 6 seconds and repeat 5 times. Put your hands behind your head. Apply pressure with your head into your hands, but no movement must take place. Hold the contraction for 6 seconds and repeat 5 times. Put your right hand on the right side of your head at eye level. Apply pressure with your head into your hand, but do not tilt your head. Hold the contraction for 6 seconds. Do the same to the left. Continue to alternate sides and repeat 5 times to the left and the right. 5 times to the left and the right. 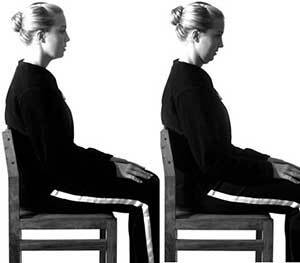 After 3 weeks you may tilt your head at an angle for exercises 1 to 4 while applying resistance. Sit on a chair and look straight forward. Relax your head muscles. You will find that your head will move slightly forward and your chin will poke outwards. Now move your head straight backwards as far as possible. You will feel that you tug in your chin when you do the movement. Do not tilt your head backwards during the movement. Hold the contraction for 6 seconds and repeat 10 times. Day 3+: Stand in front of a wall. Put your hands shoulder level against the wall. Try now to push over the wall, but no movement must take place. Hold the contraction for 6 seconds and repeat 5 times. Day 3+: Stand up straight with your arms hanging at your sides. Make yourself "tall", tuck in your navel and push your shoulder blades downwards. Your physiotherapist must make sure that you do the contraction correctly. Hold the contraction for 6 seconds and repeat 15 times. 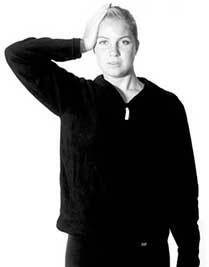 Day 10+: Do exactly the same as in Exercise 7 by stabilising the shoulder blade. Bend your elbows 90º and hold them at your sides. 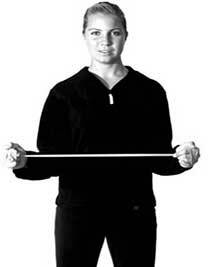 Hold the elastic band at both ends with your hands, thumbs facing upwards. Stretch the band slowly while your elbows stay at your sides. Only a small movement must take place. Repeat 15 times. As the muscles get stronger, progression can be done by doing more repetitions and/or hold the contractions for longer. This program must be done 2-3 times per day. Avoid any quick sudden neck movements. Sleep on your back or side, preferably on the non affected side. Avoid sleeping on your stomach. Keep your neck straight by shaping the pillow to support your neck. Do not sit in bed with straight legs. Rather sit at a table or over the edge of the bed when reading/eating. Avoid moving (pulling/shifting/lifting etc.) heavy objects for at least 6 weeks. Avoid activities above your head. Remember that the stretches and exercises must not cause any pain! If any of the stretches ór exercises cause any pain, reduce the intensity. If it still causes pain, stop immediately and contact your therapist.